Instead of just having a like button, is it possible to get a Up vote / Down vote buttons listed for the original idea submitted in the Idea Center? It would help users understand exactly where they need to vote as sometimes they click like on a reply instead of the original submitted idea. I've attached screenshots from other sites with simple to more complex voting options. Hi Ajay , thanks for sharing your suggestion! It is possible to change the vote button style with custom CSS. We have applied new styling to your Ideas category. If you are comfortable with CSS feel free to make adjustments to the code, or contact us at support@forumbee.com for assistance. I hope this helps! Forumbee Support Thanks for the new voting style. It's great! You guys rock! Ajay , thanks! Let us know if you need any adjustments. Hi, how do i update this for my forum? Hi Aasim , it is now enabled for the Ideas category in your account. If you would like any styling changes let us know at support@forumbee.com . Thanks! Forumbee Support Hi, I used to see it, but now its showing up as the old way (thumb likes) instead of voting. Hi Aasim , the styling is based on the category name, and it looks like your category name changed. I've updated it and it should work now. Let me know if you need it on other categories. Forumbee Support ah, didn't know that. we just changed the name of that category again. can you please re-enable? also, is there a way for me to do this myself so i don't have to ask you every time? Aasim We've updated it now and I'll send over instructions for how you can make changes to it. Forumbee Support I would love to have these instructions, could you please send them to me? Hi Carola , this voting style has been enabled for your account now. Thank you! Forumbee Support Thank you very much - in the end of next week will I probably change the structure of the categories and add some new - will they automatically have this type of voting or will I have to change for every category? Carola Ahlsson Yes, any "Ideas" categories will automatically have this type of voting. 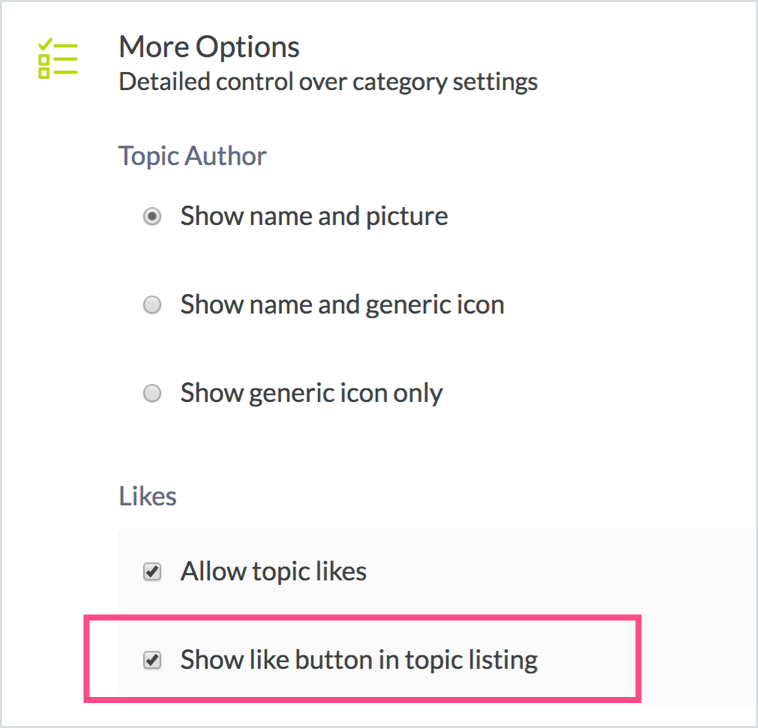 When adding a new Idea category, enable the option 'Show like button in topic listing' which you will find in category settings > More Options. Forumbee Support Great, thank you! Hi Aasim , great idea! We can get that added in to our upcoming release. Aasim The option to set the default sort to most votes has been added. Forumbee Support awesome, just saw that a couple days ago and enabled it! thanks!! Can you add this new voting style to my forum as well? Hi Neil , this voting style is now enabled for your idea categories. Forumbee Support Thanks for the prompt response! Can you change this for us as well? Aedan Thank you for posting in the community! The change has been applied in your account. Thank you! That was super fast! Hi, can I have it on mine as well please? Hi Stuart , thanks for your post! It has been enabled for your account. Forumbee Support Can you please allow me to add the voting style to my idea category? Hi Erie , sure thing! 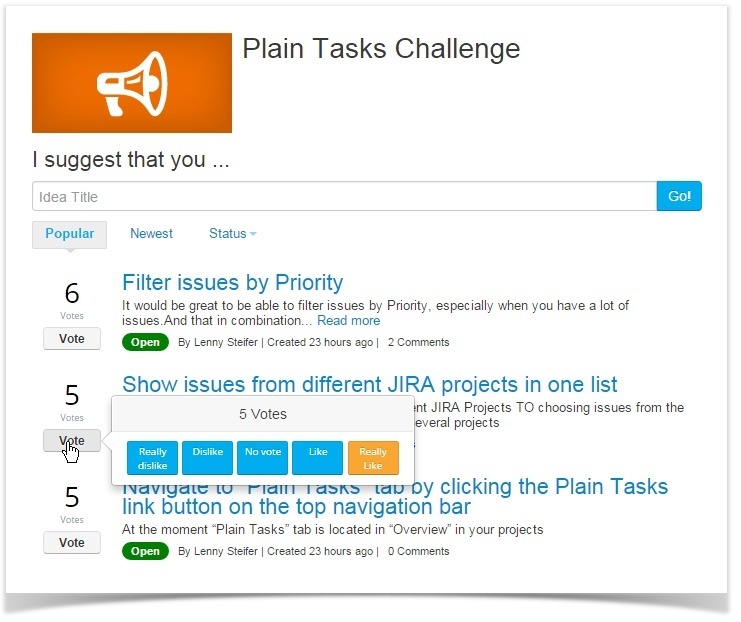 This voting style has been enabled for your idea category now.